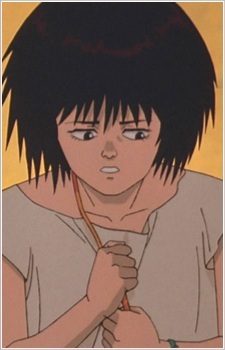 A timid young girl who ends up becoming Tetsuo's companion and Akira's babysitter. In the manga, Kaori is introduced after Neo-Tokyo is destroyed by Akira when she tries to get food for her crippled father. After she's discovered that she isn't a member of The Great Tokyo Empire, she's denied food and later on recruited by Tetsuo's aide with three other girls to serve as Tetsuo's playmates. Tetsuo gives each of the girls the government-issued drug, and mistaking it for a medicine, Kaori instead saves it for her sick father; which ends up saving her from sharing the fate of the others girls whom end up being killed by the strong effect of the drug. Her caring and innocent nature earns her Tetsuo's trust and genuine affection, and she becomes the person to whom he turns for comfort, especially whenever he suffers the strain of the power evolving within him. After Tetsuo begins to mutate and he no longer able to control his powers, his aides plan to assassinate him; hearing of that Kaori takes off to warn him, but gets shot by them. When Tetsuo finds her dying body, he enters a battle with the American army, then with Kaneda. Later on he attempts to revive her, but fails. He then carries her dead body to Akira's cryogenic chamber and she was last seen by Kei when she takes cover inside it after Tetsuo's body goes through another mutation.